Food Costs > How Much Does Broccoli Cost? How Much Does Broccoli Cost? Botanically, broccoli is a vegetable belonging to the cabbage group, which is communally known as the cruciferous vegetable. The broccoli head, often used as a vegetable, is rich in nutrients that include vitamins C and A, folic acid, calcium, and fiber. In addition, it provides protective components that protect you from diseases. Broccoli is usually cooked or steamed, but there are also people who prefer to eat it raw. Fresh broccoli can be priced by the “head” or it can be purchased by the pound. On average, the price can vary anywhere from as little as $1 to $4 per pound. The cost of broccoli will depend on the variety, where you live, the time of year and where you purchase it from. For instance, loose broccoli typically sells for $1.25 to $3 per head/bunch (or pound) while organic broccoli can cost upwards of $4. Florets, which are the tiny pieces of broccoli that are usually frozen, can retail for $1 to $4 per bag. At Walmart, for instance, a 14-ounce bag of its store-branded broccoli florets retails for a pinch more than $1. According to this Chow.com forum thread, most members claimed they had paid anywhere from $1 to $4 per pound for their broccoli. This USDA report, published in 2013, said the average price of florets were $2.57 per pound, heads were $1.64 per pound and frozen broccoli was $1.87 per pound. The large-headed variety produces several clustered florets, many of which generate smaller side shoots after the main head is harvested. The sprouting varieties grow thick and produce many small heads and best suit the climate in fall to spring. The Romanesco types produce large and gracefully twirled heads with pointed spirals. Because of this, they require plenty of space, good quality soil, and favorable growing conditions. Broccoli raab, which is closely related to the turnips, is known for its strong flavor and is most popular among Asians and Italians. It is usually grown for its young flower buds. Depending on how you cook your broccoli, there may be other items you need. For example, many people put butter and/or seasonings on the broccoli after it has been cooked or steamed. Some may also melt cheese on the top. If you eat your broccoli raw, you may prefer to dip it in a vegetable dip or even in ranch dressing. If you buy organic broccoli, make sure to clean the florets well before cooking or steaming them because there may be some bugs that have burrowed themselves into the florets. 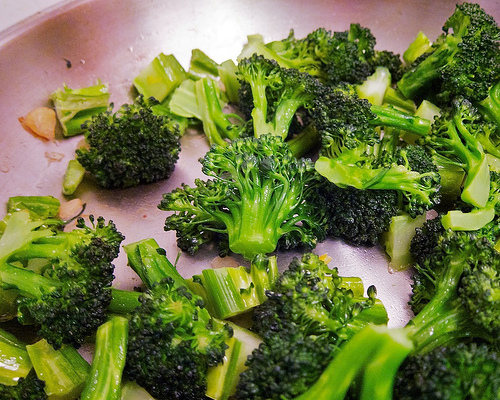 One way of getting rid of these bugs is by soaking the broccoli in salt water before cooking or steaming. The occurrence of bugs and insects usually happens since organic foods are not treated with pesticides. Broccoli tastes sweetest when it matures. If you are growing broccoli in your backyard, know that leaf-eating caterpillars love to feast on broccoli leaves; however, you can prevent this problem by growing them under row covers. Broccoli will grow best in a 6.0 to 7.0 pH soil. When steaming or cooking broccoli, make sure you do not overcook it. It is best eaten after being cooked until it is only slightly firm. Broccoli has a shelf life of seven to 14 days, depending on your date of purchase. You can tell when broccoli is going bad when the bright green color starts turning yellow. Although its calcium content is less than what a glass of milk provides, broccoli is still the suitable source of calcium for those who do not drink milk. National broccoli day is on March 22, a day sparking a “go green” celebration. In one cup of broccoli, there are 31 calories and six grams of carbohydrates. 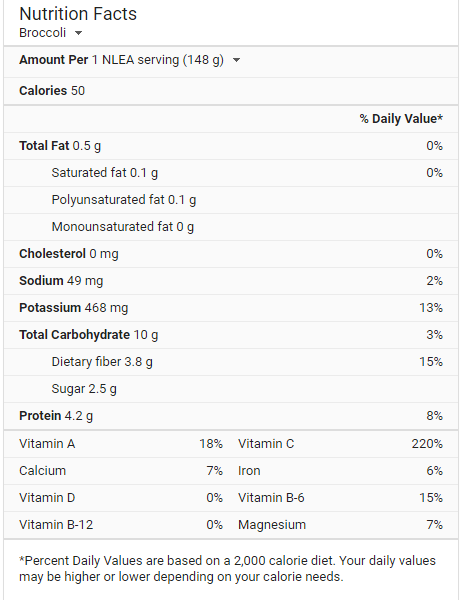 Refer to the image below to see other nutritional facts. Pay attention to the special promotions that some stores offer. Many stores often have sale prices from time to time, usually during the peak seasons. Check your local farmers markets. You should be able to find some fresh broccoli for even cheaper than you do in the store. Plus, it will taste much fresher since it’s coming straight from the farm. The FoodCoop.com, for example, lists the prices of local farmers markets and the corresponding prices. According to the prices at the time of this publishing, the cost of organic California broccoli was $3.99 per bunch, while local broccoli was $2.43 per pound. If you eat broccoli on a regular basis, you should think about growing it in your garden. This will be cheaper, very easy to grow and more convenient.